Snowwhite - Gorgeous Couture Cubic Zirconia Bridal Bracelet - SPECIAL PRICE!! HOME / BRIDAL JEWELRY / Wedding Bracelets / Snowwhite - Gorgeous Couture Cubic Zirconia Bridal Bracelet - SPECIAL PRICE!! Description: Snowwhite - New for that sophisticated and elegant bride. 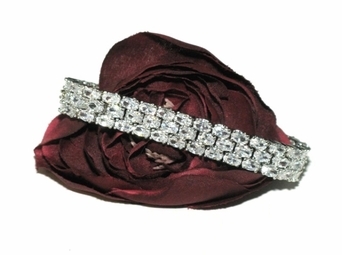 Gorgeous elegant dazzling Cubic Zirconia diamond like high end couture Bridal Bracelet. measures approximately 7" long 1/2" wide..